Carolyn had expressed interest in sequencing these. All three template DNA samples were received from Carolyn/Colleen on 20171221. Used 2uL of 1:100 dilutions from each stock. PCR reactions were run on a 1% agarose 1xTBE gel + EtBr. 5uL of O’GeneRuler DNA Ladder Mix was loaded for sizing. The results are pretty interesting (but maybe not too helpful)! Of note, is that the paper from which these primers originated from, indicated that the PCR product generated was ~1300bp. The strain that that paper used for sequence analysis was the French strain (i.e. microVar)! The other two strains amplified perfectly well, but are significantly smaller in size. This suggests a major deletion of some sort in ORF117 between the Australian/Californian vs. the French strain! It also helps explain the discrepancy noted when we originally received the Australian ORF117 from Tim Green. He indicated his lab used the primers from the paper linked above and that the insert size was 1300bp. However, when I sequenced the ORF117 plasmid he sent to us, there was only 837bp of sequence (which would match the size of the product generated here, using the ORF117 primers from the paper)! 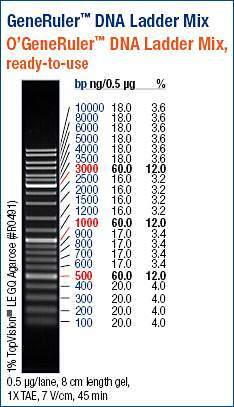 All bands were excised and DNA was purified using Ultrafree-DA spin columns (Millipore). I’ll clone all three and send of for sequencing. This entry was posted in Miscellaneous and tagged Apex Red, gel, O'geneRuler DNA Ladder Mix, OsHV, OsHV-1, OsHV_ORF117_F/R, PTC-200, Ultrafree-DA on 26 December, 2017 by kubu4. After the puzzling results from the last colony screening, I was able to get more info from Tim Green regarding the insert. This should generate a PCR product of ~1300bp. Knowing that, it’s no wonder my previous colony screen didn’t work; I didn’t set the extension time long enough! I increased the extension time to 90s to allow ample time for generating a 1300bp amplicon. I re-screened the six re-streaked colonies using both the M13 plasmid primers and the ORF117 primers. Added 20uL to each PCR tube. A miniscule amount of bacteria was collected from each streak with a sterile 10uL pipet tip, which was used to introduce bacteria to the appropriate PCR tube. Well, these results are no less confusing than the previous colony screen! The strong, fuzzy “band” at ~100bp (the lowest band) is likely primer dimers, based on size/intensity. I could potentially redo this and raise the annealing temperature in hopes of eliminating this. There is a band at ~600bp which I can’t explain. Finally, a band is also seen at ~1000bp. This is close to the size of the actual coding sequence (CDS) for this OsHV open reading frame (ORF). The ORF contains some extraneous sequence on both ends of the CDS, leading to the ~1300bp length. There is a faint, yet defined, band at ~4000bp. Coincidentally, this is very close to the size of the empty plasmid (pCR2.1 is 3.9kb). It could be possible that the band that’s present is actually just the plasmid (although, it hasn’t/shouldn’t be linearized) and not an actual PCR product. Overall, both results are confusing. I’ll just go ahead and sequence one of the colonies using the M13 primers and see what’s there. This entry was posted in Miscellaneous and tagged Apex Red, colony PCR, gel, M13F/R, O'geneRuler DNA Ladder Mix, OsHV, OsHV ORF117, OsHV-1, OsHV_ORF117_F/R, pCR2.1, PTC-200, Tim Green on 2 August, 2017 by kubu4. Screened five colonies from yesterday’s transformation via PCR using M13 primers. I don’t have any sequence for the actual insert, so am relying on assessing empty vector vs vector with insert, based on PCR amplicon size. Colonies were selected randomly, streaked on a new LB Amp100 plate with a sterile pipet tip, and then added to the PCR tube. Well, these results are confusing. Immediate conclusion is that all colonies screened are empty, due to the small size of the amplicons produced (<100bp). However, looking at a vector map of pCR2.1 (the vector that the OsHV-1 ORF117 is supposedly cloned in), there are ~200bp between the M13 forward and M13 reverse primers. So, even an empty vector should produce an amplicon larger than what is seen on this gel. I’ll contact Tim Green to see if he can provide any insight (and/or any actual sequence for OsHV-1 ORF117 so that I can order an insert specific primer to aid in confirmation). This entry was posted in Miscellaneous and tagged colony PCR, gel, GoTaq Green Master Mix, M13F/R, O'geneRuler DNA Ladder Mix, OsHV, OsHV ORF117, OsHV-1, PCR, Tim Green on 13 July, 2017 by kubu4. Received the sample described above (and pictured below) from Tim Green via Colleen Burge. Plasmid was sent dried, on filter paper. Will elute plasmid from one circle of filter paper with 50uL of TE buffer. This entry was posted in Samples Received and tagged Colleen Burge, OsHV, OsHV ORF117, OsHV-1, pCR2.1, Tim Green on 29 June, 2017 by kubu4.